Fifty years after Pope Paul VI traveled to the Holy Land on what was the first trip by a pope outside Italy since 1809, Pope Francis will make a pilgrimage to Jordan, the Palestinian territories and Israel this weekend. This is only Francis’ second trip outside Italy – he went to Brazil last year for World Youth Day – but three of his predecessors have covered a significant percentage of the globe. 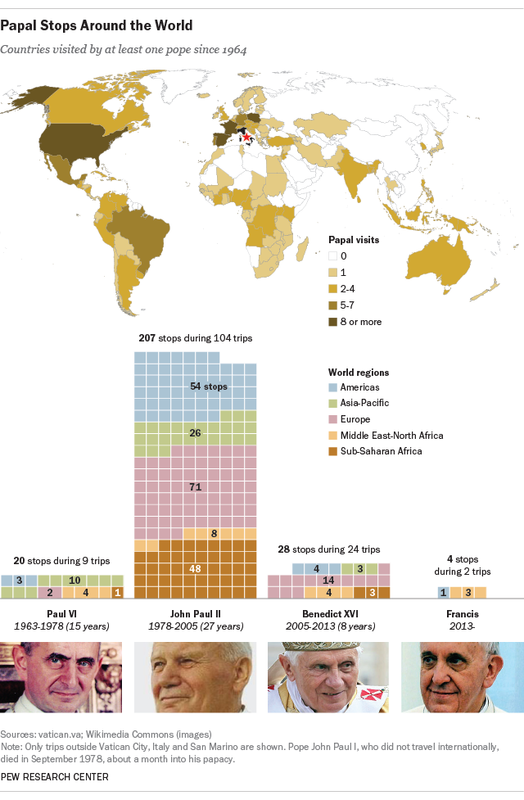 Led by the prolific travels of Pope John Paul II, pontiffs have reached 135 different countries and territories at least once (not including Vatican City, Italy and San Marino) since 1964. Overall, popes have gone on 139 international trips with more than 250 official country visits, according to travel logs posted on the Vatican’s website. Poland (10 visits), the United States (nine), Spain and France (eight each) are among the most frequent destinations, but popes also have traveled to small African nations such as Lesotho and Pacific islands such as Fiji. After this weekend, all four popes who’ve traveled outside Europe (Paul VI, John Paul II, Benedict XVI and Francis) will have visited the Holy Land. Bill Webster is an Information Graphics Designer at the Pew Research Center.